I never took ‘before’ photos. I couldn’t bring myself to. It was too painful to have it on record that the bathroom even belonged in our house. Imagine if you will: a small 5’x10′ (ish) dungeon room. No window. Orange peel textured walls. Builders grade oak vanity (one sink, white tiled countertop). Small, shallow fiberglass bathtub. Peach and teal linoleum floor. Plastic baseboard with about a 1.5″ bumpy, dust-collecting caulk line between the flooring and the bathtub. And teenage cooties. Don’t forget the cooties. Lots and lots of them. I never went into the bathroom. EVER. We’ve lived here for eight years and I’ve never taken a bath. Pointless endeavor. That room would be the last place I would ever think of going for a relaxing time. This year I finally managed to get my husband to agree that the bathroom should be condemned. We needed – Nay! We DESERVED a new bathroom!!!! (The saddest part of this is that it’s actually the kids’ bathroom, and a guest bathroom – should we ever decide to be social enough to invite people to stay). The kids were happy that the bathroom was going to be gutted: they didn’t need to clean it. The walls and floor insulated (Our bedroom shares a wall with the bathroom. We’re old. We don’t like noise. Our kids are noisy. They need to be silenced). A decent size bathtub, while still working with the 5ft limited space. A shower with a hand held shower attachment. So, do me a favor, close your eyes and imagine what the ‘before’ photo would have looked like. Disgusting, right? Now, open your eyes, and see what the bathroom looks like now. The bathroom can finally get ventilation and natural light. That little 12″x 36″ is small in size but MASSIVE in impact. I have never been so happy (seriously, I need to get out more). 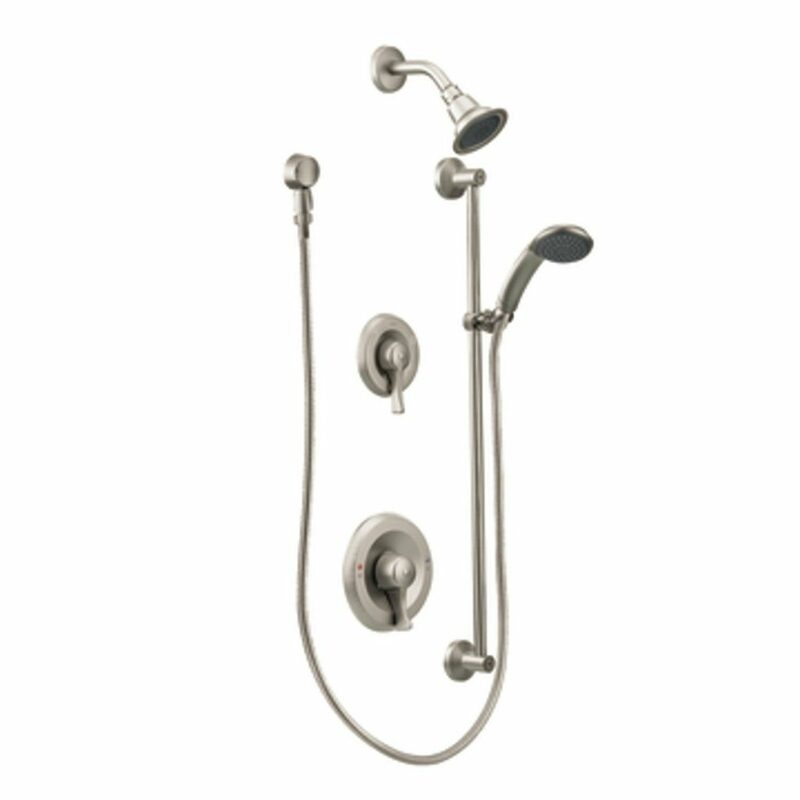 The shower combo is a great addition to the bathroom; it allows you to wash your hair while taking a bath in the soaking tub, plus it’s stinking fantastic for cleaning the bath. Even giving the dog a shower! Truly truly a genius idea. *Update: I love this set-up so much that I’ve decided to install it in our master bathroom. We have an enclosed shower and will have a frameless glass shower door. It will make cleaning the shower so much easier!!! (and I will willingly pay $$ for an easier life). After the walls were insulated they were covered with shiplap (I decided to use the rough side of it, for interest). I wanted a very neutral color palette and decided to bring contrast to the room using different textures rather than color. The walls have been painted with Benjamin Moore Heaven (how can you not love it with a name like that!). I painted the shiplap and ceiling in a satin, and the baseboard in Heaven semi-gloss. We used a neutral quartz for the countertop and installed an additional sink. One sink + three teenagers was trouble waiting to happen. Now hopefully conflict has being avoided…at least for now. I went with a single holed faucet for its practicality. I hate trying to clean center set faucets. I wanted to keep the original vanity. It has tons of storage, and is in great shape (admittedly, I did hate the oak). It seemed silly to throw away a perfectly good vanity. I’m English, remember. I don’t like to spend money if I don’t have to. It goes unbelievably well with the marble herringbone floor tile. I realized a long time ago that you don’t necessarily have to spend lots of money on high-end finishes to get the ‘WOW’ factor. The floor was my big indulgence. 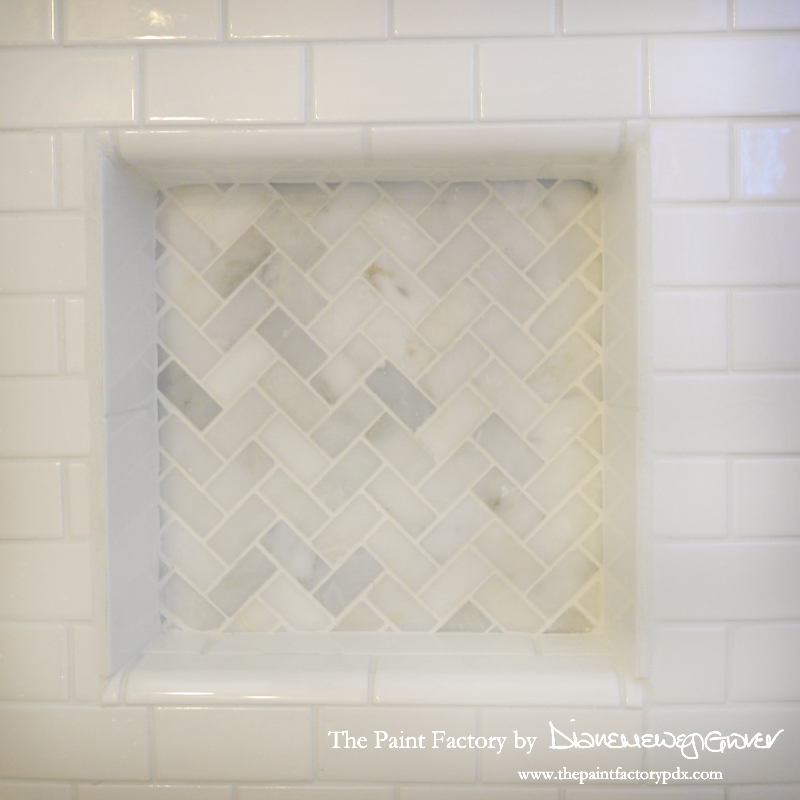 I love herringbone, and I love marble (and it’s a small room so it didn’t break the bank). 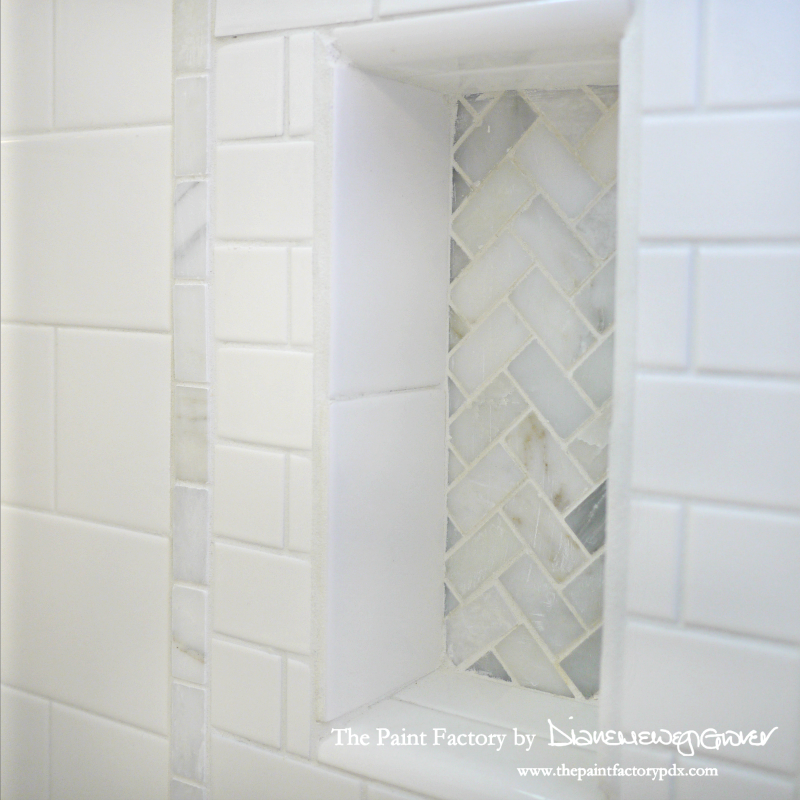 But with the shower surround I saved big $$ by using two different sizes of white subway tiles (cheap as chips) and did a little detail work with the marble herringbone. The shower has white grout, the floor has a very light gray grout. The contrast is just beautiful. The lighting is from Rejuvenation in Portland. I don’t like to be too matchy-matchy. So although most of my fixtures are brushed nickel, the lights are rubbed bronze (just to add interest). 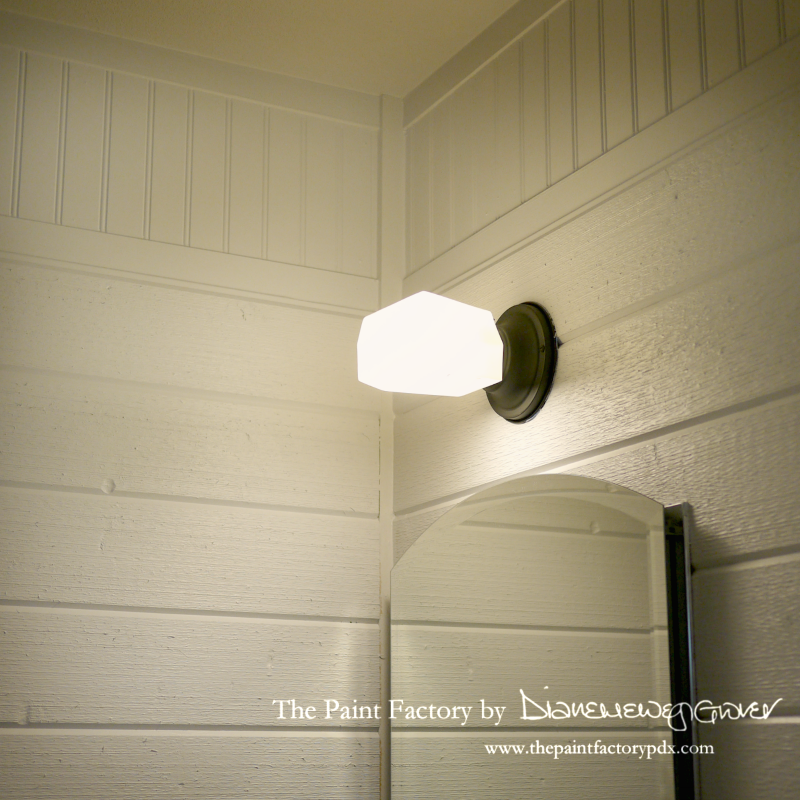 Although I used shiplap on most of the wall, I added a band of beadboard around the top of the wall. Same color, but different texture. Doing this type of detailing draws your eyes up, giving the sense that the room is bigger than it really is. When our contractor tore down the walls, I realized that it would be a perfect chance to add medicine cabinets to the room instead of standard mirrors. My girls have a cabinet each to store their toiletries. My son doesn’t. And in typical boy fashion, he seems not to care. Purple in a bathroom? Yes, yes yes!! 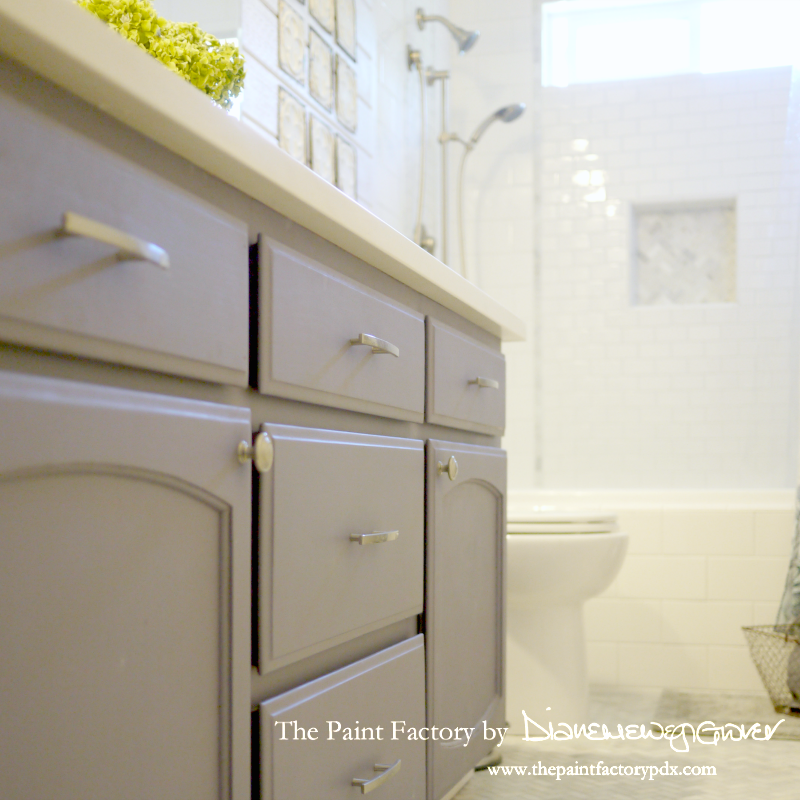 The paint color is called Bohemian by Pure & Original in Classico. Although it has a built-in sealer, because of the humidity etc, I sealed it with P&O Dead Flat finish. Because who doesn’t want to have a dead flat finish in a bathroom?? Unheard of! 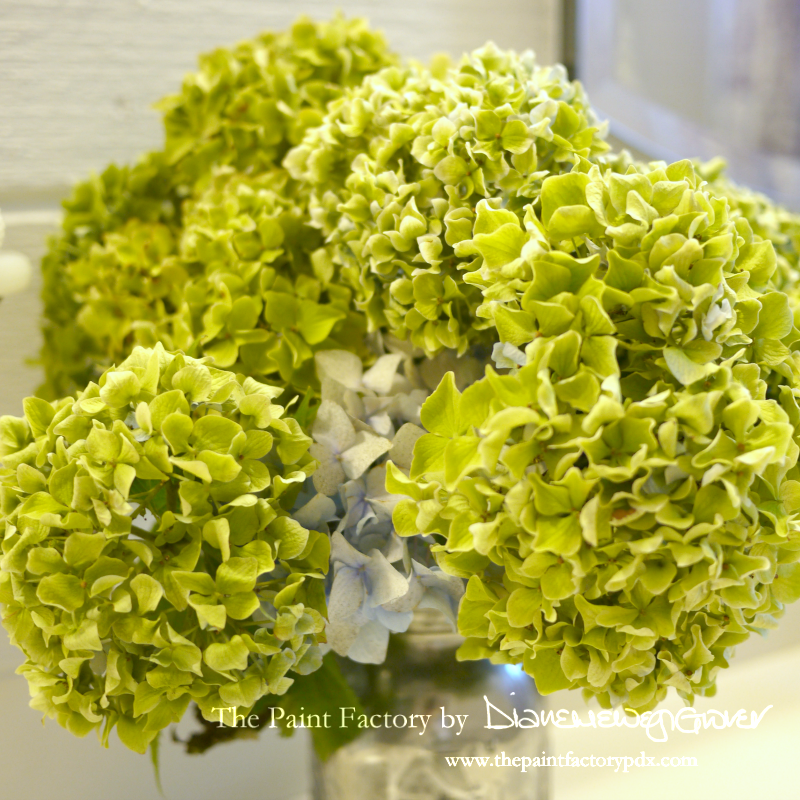 Hydrangeas from the garden. These are here purely for staging. I’ve had these antique tin ceiling tiles for years. I think I bought them on Ebay. They used to hang in our bedroom. They look so much nicer in the bathroom, against the shiplap. And there you have it, the kids’ bathroom. Eight years in the making. Finished in 10 days. And there isn’t a chance in hell that the rolled towels in the shopping basket will stay that way. (Side note: The hydrangeas quickly died. The wire basket was kicked about and then tossed into the hallway. The towels no longer adorn the vintage hooks on the wall; most often they are seen laying wet and underappreciated on the tile floor. In three years all the kids will be in college. Only then will I venture to go inside and check what else they’ve done to it). ← The Most Challenging Piece, To Date. Oh Diane, what a beautiful bathroom!! You could also give design advice (for $ of course) because who would think of using the beadboard on top of the shiplap? The colors are A+ spot on…..!! Can’t really see, but I guess the floor matches the shampoo cubby? Wow, makes me want to do mine over again!! I hope you at least kept the “before” pics for your own amusement! It was fun designing it. Allison. It kills me that it’s the kids bathroom, ours is still the original 🙁 Yes, the floor is the same material as the niches. Beautiful, wish it was in my house! Great job, especially with those tight constraints. 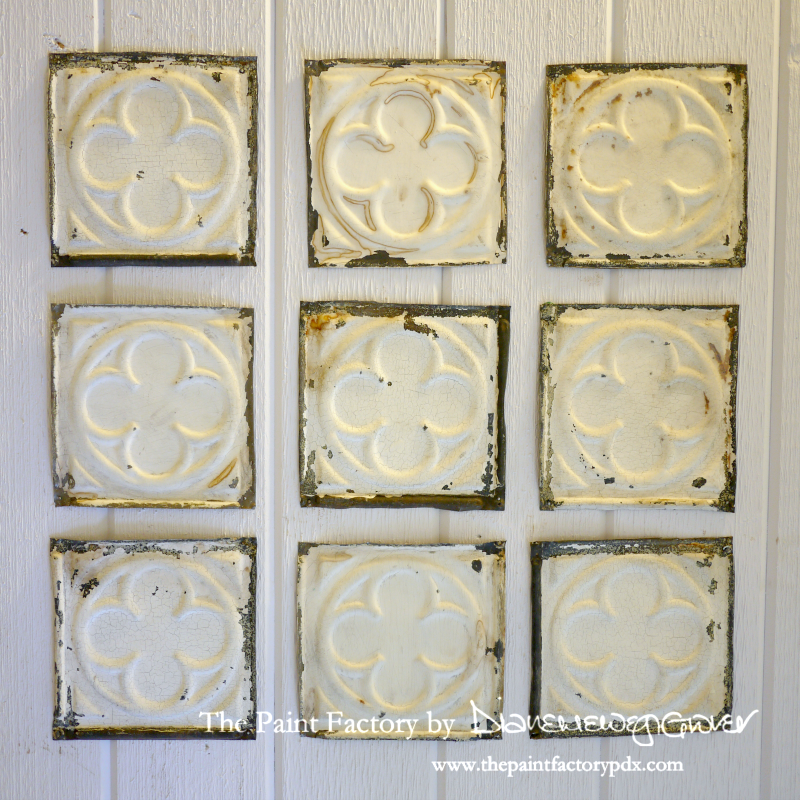 Love the marble tile, it adds interest and a vintage look. Those kids are lucky. And get to work on yours! They will have many chances to have nice bathrooms; time is not on your side, girl! Oooooh! So lovely! That combo of marble and subway tile is beautiful. Where did you get the tile and what kind of wood did you use for the ship lap ? Here’s the link for the marble tile. They have something similar at Lowes (but it had a more yellow tone to it). And the ship lap we just bought from Lowes. Just gorgeous in every way, including the new quiet for you two. How does R like it?????? Dead Flat Eco finish is made by Pure & Original. 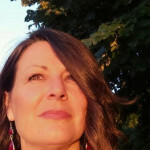 This is my affiliate link to it (I think it’s still active). 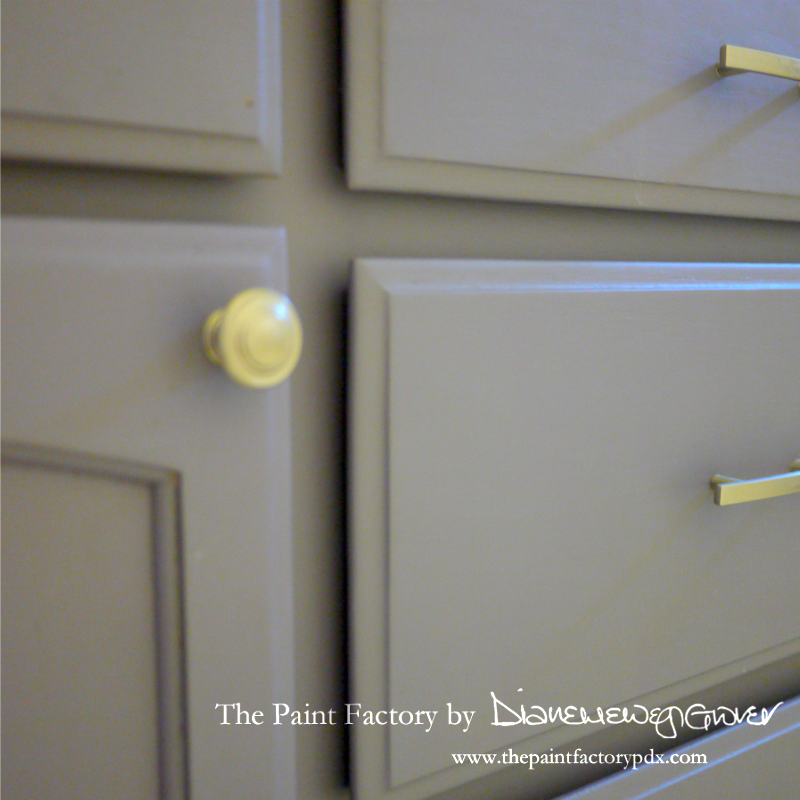 bit.ly/TpF11 It is a gorgeous topcoat, I did my kitchen cabinets in it. It’s just beautiful! It’s so fresh and bright and airy… I love it?job well done I would think. This is beautiful! You are very creative. I would have never thought to add so many different details to make this room pop. You would never guess the size of the room is so small. And I agree, you need to be thinking about your bathroom. We redid ours ( not nearly as creative) and it made a world of difference! Really beautiful!!! 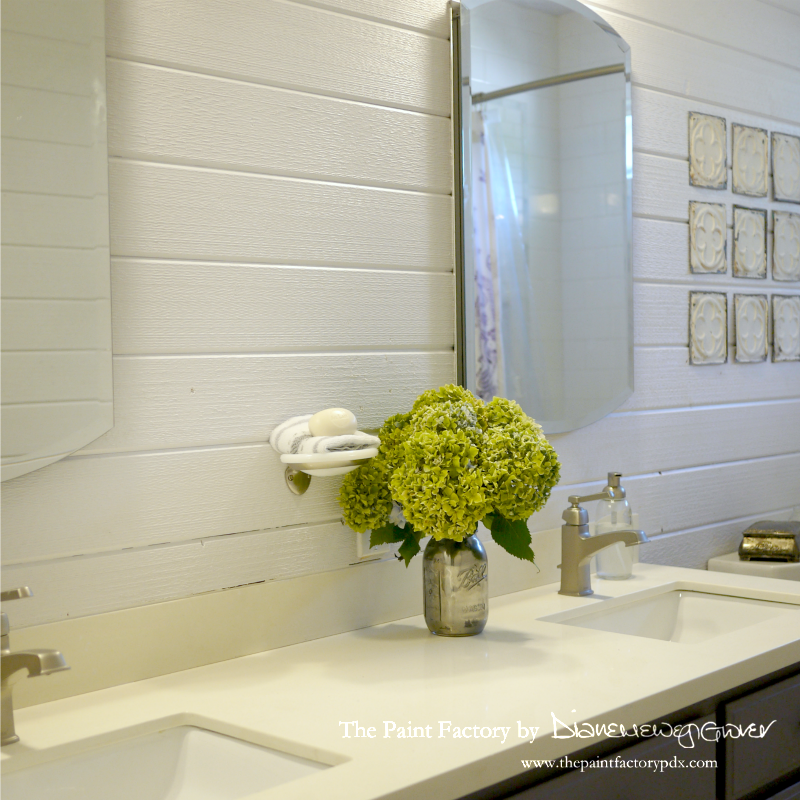 I love what you did with the different tile sizes and mixing the shiplap and beadboard. Creates such so much visual interest. Did you do this work yourself (!)? Has a cozy vintage look. Very inviting 🙂 Perfection, Diane. I am not allowed to be around power tools! I had the contractor who installed out wood floors to do the job. I would have started a long time ago, had it not been for my husband!! So lovely. Your color palette is so restful and the herringbone pattern is subtle but glamorous (if that is even possible). Thank you Susan! My contractor thought I was a little nuts when I told him I was going to paint the vanity purple!! Love the bath room. I am doing mine now. I was torn between the surround and the sub way tile but have decried to do the tile also. My bathroom is 5×8. Yes that’s what I said. Sum times you have to decided what you are going to do befreyou go in,lol. Hope mine comes out as nice. I love the bathroom, It’s beautiful, great job. U r hilarious!!!! 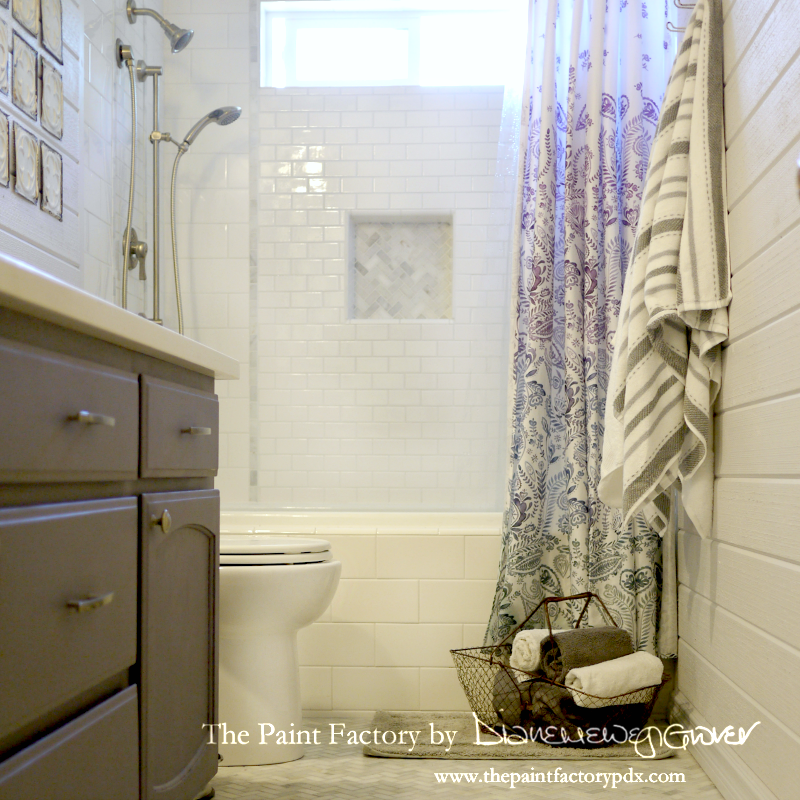 Loved reading this…great bathroom redo!! Looks wonderful! Kudos in getting it finished. I have two bathrooms that are screaming for something new, especially with updating the wallpaper. Just wondered if you have ever painted over wallpaper. I am too chicken to learn how to wallpaper, even though I decoupage and image transfer, etc. and just basically love paper. Any ideas? Saw some different blogs where brave souls plastered and painted over the wallpaper. I don’t have the heart to ask what it looks like today…. I did it once. We lived in a 100 year old farmhouse and the walls were horsehair plaster. We didn’t dare remove the wallpaper because we feared that it would bring down the plaster. So we painted it. And I hated it. It looked fine from a distance, but you could still see the seams. I wouldn’t do it again. If you decide to strip the wallpaper, try treating it with fabric softener and water first. It comes off so easily!